When the Real Techniques Miracle Complexion Sponge came out, I wasn't overly keen to try it. I've had the Beauty Blender for over 2 years now and it's still in pristine condition, and it really is as fantastic as everyone says. However, when I bought my two new brushes from Wednesday's post, a 3 for 2 offer led me to giving it a go. I took it on holiday with me to give it a good trial, and so I thought I'd do a little comparison post. Firstly, obviously the shape of each sponge is different. The Beauty Blender is much better for fitting under the eyes with the teardrop shape, and I do find the flat edge of the RT sponge a bit useless, and used the other end or the sides most of the time. The texture of the RT sponge is much denser than the Beauty Blender, but with more use, I've noticed it doesn't feel as dense so it could just take a while to loosen up. I have noticed that the Beauty Blender does expand more than the RT sponge when you run it under water, which could suggest that the Beauty Blender gives a more flawless finish as it has more moisture in it. In terms of application, I was really impressed by RT. I found it blended out foundation just as well as the Beauty Blender and really did make the foundation look like skin and not like a mask on top of my skin. As I said above, I do prefer the Beauty Blender for areas like the under eye as the shape is more convenient to blend there, but that's my only major niggle with the RT sponge. 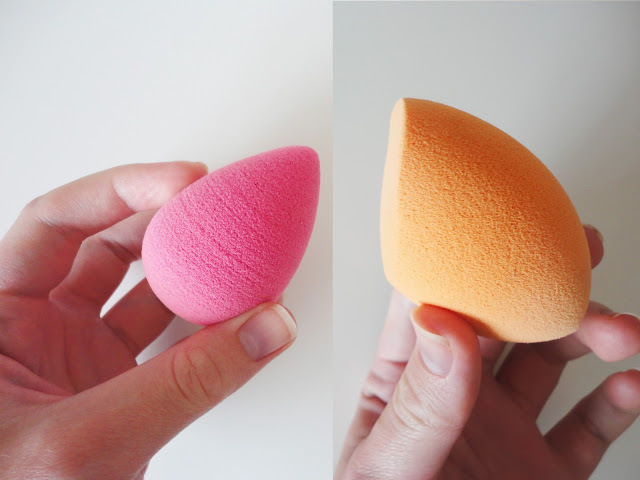 Other than that, I'd say I'm really impressed with it, and if you have never tried a makeup sponge, I'd definitely recommend giving the Real Techniques one a go before taking the plunge with the Beauty Blender. The Beauty Blender is more than twice the price of RT at £16 (the RT sponge is £5.99), but I'd still highly recommend it, as mine's lasted over 2 years and (as you can see from the photo), still looks great! Obviously, I've not had my RT one as long so I can't say how good the longevity is on it. If you are wondering how to clean them, I loved Kaushal's video on how she cleans hers, and I just use a regular bar of soap to clean mine and they both look as good as new! I also liked Tati's video on how to deep clean them from a while ago. Have you got either of these sponges? Let me know what you think of them in the comments!